Whether you want to be in front of the microphone, in music technology, or to be the songwriting genius behind it all, this is your opportunity to create your own musical masterpiece. 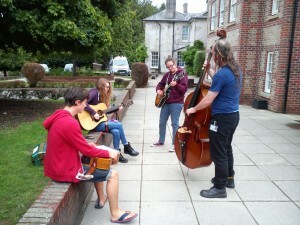 Work with other young people and the team to prepare an original pop, rock, dance, worship etc song. Record the vocals and instruments – if you play an instrument, please do bring it along if you can. Work on sound processing and editing to create one or more remixes. Take your finished project home on the camp CD at the end of the week. There may also be the opportunity to work with the Video activity to create a music video for your song for inclusion on a DVD.